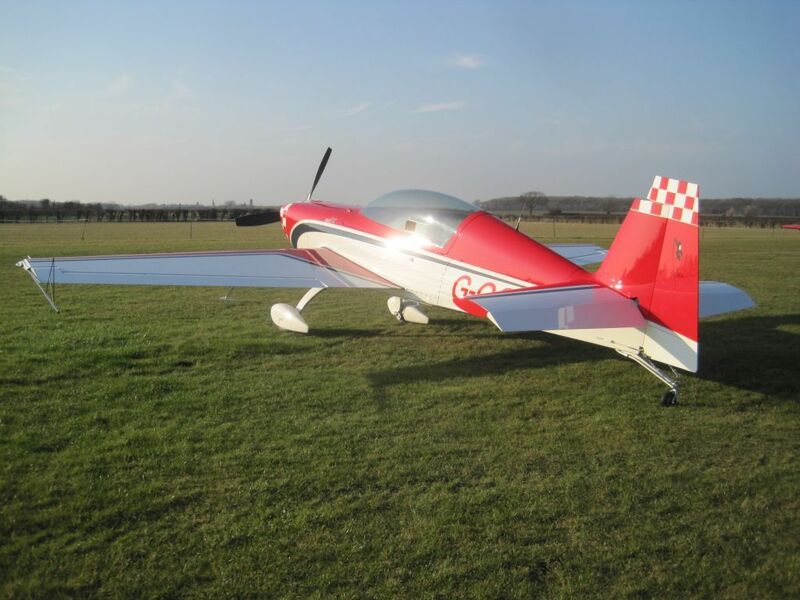 G-GOFF is the very first Extra 330LX to arrive in the UK, sold and flown in by Mark Jefferies of YAK UK Ltd. Walter Extra and his team at Dinslaken have done an outstanding job of taking the 300L and upgrading to the 330LX. For all intents and purposes it looks just like the 300L but the flying characteristics have completely been transformed. The ailerons have been redesigned with aerodynamic spades, these serve 3 purposes, 1, stick forces lightening, 2, increased roll rate, 3, instant stops of roll with no “bobble” in the center. The airframe has been lightened to 630 kgs empty weight, this has been done by using carbon fiber for all cowlings and panels and in some cases control runs along with other subtle component redesigning . Another very good change is the tail plane and elevators, these have been redesigned to be lighter in feel with less stick deflection. The rudder is also larger helping with those advanced gyroscopic figures and snap rolls. Lastly the new Lycoming IO-580 engine with 315 HP is fitted.